Lay out the two halves of the roll or bagel. Spread the inner side of each with pesto. 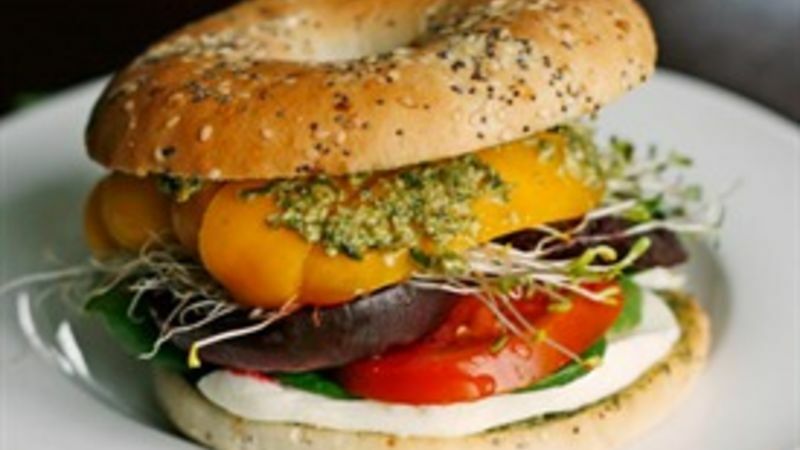 Layer the mozzarella, tomato, spinach, beet, alfalfa sprouts and bell pepper, covering with the other half of the roll. Lately, I have been changing up my usual sandwich routine. Out is my favorite 7-Grain bread and in are thin-style rolls and bagels (a mere 3 WW points!). And instead of just deli meat and cheese on my rolls, I am piling them high with veggies. This sandwich, my Super Veggie Sandwich, is one of my new favorite lunches. It starts with a thin roll – actually a bagel, in this case. But a roll would work too – spread with a thin layer of pesto. Then it’s topped with fresh mozzarella, tomato, spinach, beets, alfalfa sprouts and bell pepper. That’s a lot of veggies (and they taste so good together). I love how this relatively light sandwich doesn’t feel like it’s a relatively light sandwich. I mean how could it when it’s so thick and bold in your hands? Seriously. It seems practically indulgent. The recipe details one way to make this, but you could totally get creative. Toss in some cucumber slices, add a slice or two of prosciutto or trade the alfalfa sprouts for bean sprouts – or whatever else you can imagine. What about your favorite sandwich? What’s in it? What’s the bread? And why do you love it so?